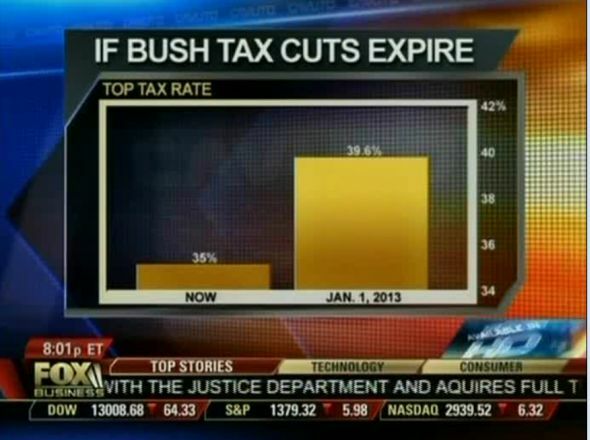 @foxjust @DanielPink That’s possibly the one of the worst represented charts I’ve ever seen. The urge to contextualize the data is a good one, but context does not come from empty vertical space reaching down to zero, a number which does not even occur in a good many data sets. Instead, for context, show more data horizontally! I love that he went to the effort to make that (thanks, Abhinav!) but … it is less informative than the original chart. 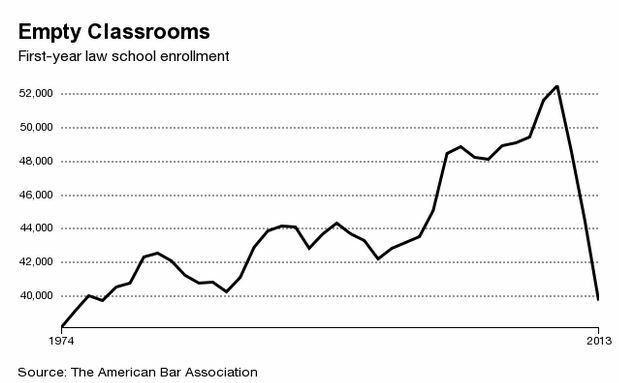 Yes, in the new version it’s now crystal clear that law-school enrollment hasn’t gone to zero. But who looked at the original chart and thought it had? (Well, this guy says he did, but I think he’s kidding.) And the contrast between the herky-jerky rise of the past four decades and the straight-line drop since 2010 is much less clear in the zero-base chart. It hides the precipitousness of law schools’ change in fortunes. When I checked the Twitter bios of the people who objected to Businessweek.com chart, most of them were software programmers, so I wondered if it was some weird coder obsession. It might be, but a simpler explanation was that prominent programmer Jeff Atwood had retweeted it to his 152,000 followers. This isn’t much of a time series, and I really can’t think of any good reason why the y-axis on a bar chart shouldn’t go to zero. But more important than any simple rule is that this chart was obviously crafted to deceive — there’s really no other reason to draw the chart this way. The Businessweek.com chart, on the other hand, was crafted to show the data as fully as possible. Facebook “data visualization guru” Andy Kriebel recommends adding a note to any non-zero-based-y-axis chart explaining why you didn’t base it at zero. That’s not a bad idea, but I also think the overwhelming majority of those who read a chart like this one online (as opposed to those who see a chart flitting by on the TV screen) are able to figure out what’s going on. I love that so many people online are on the lookout for dodgy charts. But focusing on the data isn’t really dodgy. I have to agree with them about the Y axis. Not because it should be a hard and fast rule but because of the metaphor problem. Our brains create 0 when your line begins or ends at the bottom — a metaphorical zero as in “no one is going to law school because the line’s at the bottom.” This is exacerbated by the headline “Empty Classrooms,” which creates a textual cue that “empty” is what matters. There’s also the slope problem. Tufte is right and wrong. He’s right about just show the data but a truncated axis doesn’t actually show the data. The data is not the line, the line divides space that represents the proportion of a (those enrolling) and b (those not). So by truncating the axis we not only create a more severe-looking slope, we literally hide representative space, and more on one side than the other. In theory we could build this same chart with three data points — ‘74, ‘10, ’13 — unless those three small humps on the climb matter to the story, which I don’t think they do. Basically start with as few data points as possible then add as necessary. Don’t even connect the lines necessarily; use points. Bloomberg View today announced that Justin Fox will join the opinion and analysis site on January 5 as a columnist covering corporate strategy and trends, innovation and the broad business landscape. Ben had gotten the news from Bloomberg View’s PR people in hopes that he’d put it in his widely read Morning Money daily e-mail the next day (which he did). But he didn’t realize he was supposed to hold off, possibly because he’d known for weeks that I was considering the job. I’d gone for a long stroll in Central Park one afternoon to think things through, run into Ben and his son playing in the dirt, and, because I’m really bad at keeping secrets, immediately blurted out why I was on walkabout. Anyway, the early disclosure was fine, because on Tuesday Bloomberg announced that John Micklethwait of The Economist was replacing Matt Winkler as its Editor-in-Chief, and my news was entirely forgotten. Good thing, because I’m still at HBR and I’ve got a bunch of work to do.